It’s been a while since I’ve been excited for a Spider-Man game… Well, that isn’t true. I was excited for the last one (Web of Shadows) until I realized I had a more violent version of it (Prototype). So, what’d I think of it? Well, this is a Spider-Man game through and through. It’s got the swinging aspects (though not nearly as prevalent in this game), it’s got the “trash talking” cheesy quips (tons of these), it’s got the Marvel characters (some beloved and some that aren’t used as much… was a nice change), and of course the over arcing story connecting to one main boss. What else made this a Spider-Man game? Well, the effed camera angle on occasion that nearly made me turn off the game, a ridiculously cheap boss fight (first one of two, you’ll know when you do it), the repetitious gameplay mechanics… Do these make the game not worth playing? Hardly. If you like Spider-Man and have followed the series at all, you should play this game. If you’ve never played a Spider-Man game, but had an interest? You should play this game. I’d say the only other game that comes close to showing him in his true light is Ultimate Spider-Man for the last generation of systems. Alright, that’s cool and all Jason, but how’s it set up? Oh, well, I’m so glad you asked. 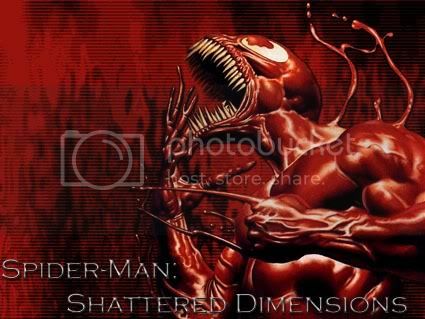 Few will remember the old PS1 Spidey games, but they were level based and fairly short – very linear games. Linear, you mean like Final Fantasy XIII? Well… sure. Why not? Does it make it bad if it’s linear? Well, let’s take a look at all the current day FPS games… Hmm, nope. People love them. Well, what about the voice acting? Huh? Does it have all those fancy stars talking like other games? Well… yes. Neil Patrick Harris plays the Amazing Spider-Man, Stan Lee narrates (which he hasn’t done since the last Spider-Man game I bought back in 2001 on the PS1), John DiMaggio voices Hammerhead, Steven Blum voices Silvermane 2099, Hobgoblin 2099, Noir Vulture, and Vulture 2099, Jim Cummings (most importantly the voice of Winnie the Pooh and Tigger in recent years) voices Kraven the Hunter, Tinkerer, Noir Goblin, and Noir Boomerang, and finally… Nolan North plays Deadpool and Carnage. There were others, but… yeah. Who wants to read the credits to a game in a review? Cool beans. It has famous people, it has a play mechanic that is used by other games, and…? Well, it’s fun. In increments, at least. Each dimension plays pretty much the same (aside from Noir), so if you get tired of playing one… you should probably just turn it off and do something else for a bit. But each one executes the worlds as well as they can. 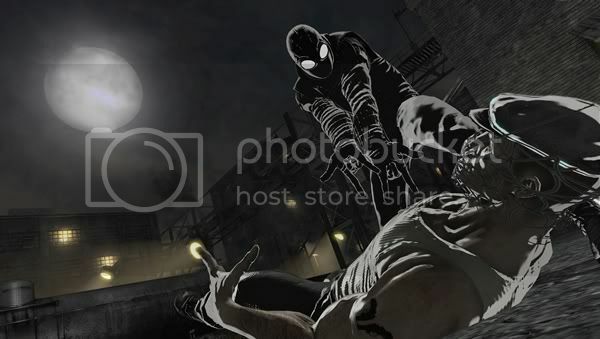 Each has a different art style (always appreciated by me – I buy games for art styles alone), and the Noir dimension does an Arkham Asylum type of gameplay in addition to the others’ traditional 3rd person beat ’em up gameplay. And, well… it’s just fun. I enjoyed myself playing it, which is more than I can say for games like Wolfenstein or Dead Rising 2. Want to do everything in the game, like get platinum medals on hard mode for each level? Well, I imagine you’ll need a bit of time with the game. But honestly, if you want it that bad, you could do it in a week. Worth a play through, though there are definitely games that supersede it in being great and worth a buy. The length of games really determines my desire to buy them anymore, unless they take my breath away while playing. In any case, a very worthy RENT.